This device plugs into a USB port and implements a USB HID keyboard. Instead of doing anything useful, it waits between 30 seconds and 8 minutes and sends the scancode for the Caps Lock key. This will toggle the Caps Lock status on or off. Since the operating system controls the LED on the keyboard, the Caps Lock light also toggles. This makes it appear the user has accidentally pressed the Caps Lock key...until it happens 20 or 30 times and they get suspicious. Then they might see the Caps Lock light turn on by itself. Next is a sequence of reboots, bashing the keyboard on the desk, clicking through the Control Panel, possibly even replacing the keyboard. Unless they notice the tiny little device sitting in one of the USB ports on the back of their computer, nothing will help. Disclaimer: This device provides keyboard input to a computing device outside of user control. It is intended for experimentation and demonstration purposes only. It should never be used in a situation that can result in loss of data, property, or finances. It should never be used in a situation that could cause harm to a person via operation or failure. Usage of this device is beyond my control and I am not responsible for any damages resulting. The CapsLocker was built on an Atmel AVR ATTiny45, and heavily based on the EasyLogger application from ObDev. Very little code modification was necessary to get the random Caps Lock activation working. This is a single-sided PCB with a couple of jumper wires for simplicity. If I had decided to use the test clips from the beginning, the jumper wires would be unnecessary. Here are some additional photos showing the installed device and heatshrink over the part that extends from the USB port. Some have commented on the apparently dirtiness/hairyness of my computer. It really doesn't look that bad until you get up close and use a camera flash. That particular computer has been sitting in the same place on the floor for a year or two, so dust does accumulate. It's probably time to find the vacuum cleaner attachment kit. Print the mirrored PCB on glossy photo paper and trim to the size needed. Iron onto freshly-scoured copper clad until firmly attached. Soak at least 30 minutes in water, then carefully peel off the paper. Fibers will still be attached, rub these off with fingers or a soft toothbrush. Place board in etching solution until all exposed copper is gone. Use solvent such as acetone to scrub off the toner. Use PCB shear or diamond cutoff wheel to cut board to edge of dotted line around PCB. Solder parts onto PCB. It may also help to tin the USB pads, to prevent connection problems due to oxidation. We're not going to be using gold plate, so solder will have to do. I just started putting mine together and wanted to add to your section on etching & soldering. If you coat the PCB with a clear Acrylic spray paint after removing the toner it will act as a sealant to protect the copper from oxidation. You'll still need to tin the USB connection pins, but the other traces will be protected. It will also act as a flux to prevent solder crossover to adjacent pins. Trim piece of plastic to size of PCB and super glue to the bottom side. Important: make sure the plastic shim is wide enough to prevent the PCB from sliding sideways in a USB port...test it. 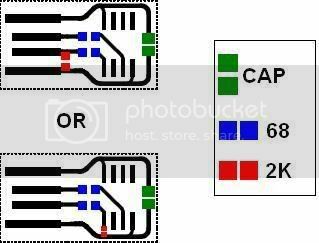 The required thickness of the plastic will also depend on your PCB thickness. The total thickness at the USB connector should be just under 2.0mm or 0.079 inches; trim or sand the plastic to match. Too thick may break the computer's USB connector, too thin may not allow a good connection. Using reference from AVR ISP connector pinouts and the pin names on the schematic, find a way to connect an ISP header to the PCB temporarily. My solution involved a USB jack and two fine-tipped test clips. Other possible solutions may involve a jig with spring pins, kynar wire temporarily soldered to the right locations, or a clip that fits over the SOIC8 on the PCB. All of the above eventually must connect to an AVR ISP header, and this must be connected to a PC through an AVR ISP adapter. These are inexpensive and available from several sources: USBTinyISP, AVRISP, AVR Dragon, and many more Google can tell you about. Download capslocker.hex and use AVR Studio or a standalone programming tool to write into the ATTiny45 Flash. Oh, you'll also need to select the fuse for PLL/1k clock source. The ZIP file above contains the PCB, schematic, and C source code. It is based on the latest version of the EasyLogger code. I've imported everything into an AVR Studio project, but it can be compiled with standard GCC tools that have ATTiny45 support. I have trimmed out the portions of code that were not necessary in this application, and added the modifications required to press the Caps Lock key at random intervals (psuedorandom, the same pattern will occur on every powerup). As the code will make evident, the Objective Development software USB library makes it extremely simple to create a USB device. Develop firmware that allows switching between mouse and keyboard, user selectable pools of keypress options, phrases, timing configuration, etc. All controlled via Control reports from an application on a PC. Device would wait for 15 seconds after being plugged in, and begin normal operation if the configuration application did not contact it during the startup time. Submitted by Anonymous (not verified) on Tue, 04/01/2008 - 18:59. This, my friends, is what the word "awesome" is made for. Submitted by Anonymous (not verified) on Wed, 04/02/2008 - 08:51.
could you have it "type"
Submitted by Anonymous (not verified) on Wed, 04/02/2008 - 08:54.
could you have it "type" something too? How about "I'm watching you...."
Submitted by Anonymous (not verified) on Wed, 04/02/2008 - 10:06.
or it culd hit "backspace"
Submitted by Anonymous (not verified) on Wed, 04/02/2008 - 10:14. Submitted by Anonymous (not verified) on Wed, 04/02/2008 - 15:50. Submitted by Anonymous (not verified) on Sat, 04/12/2008 - 11:57. WIN-R for execute dialog, then start any program and insert any key sequence - hotkeys or TAB for field selection, SPACE for button press. Submitted by Anonymous (not verified) on Fri, 05/14/2010 - 12:19. Submitted by Cpt. Obvious (not verified) on Sun, 04/29/2012 - 02:15. They were obviously demonstrating their recommendation by doing that... Kinda went right over your head, huh? I prefer it to type "redrum"
Submitted by Anonymous (not verified) on Sun, 08/03/2008 - 16:09. I prefer it to type "redrum" randomly. Submitted by Anonymous (not verified) on Tue, 04/08/2008 - 05:34. Here, here. The larger the percentage of other people in the world that fall into this category. The better it is for mankind. Submitted by Anonymous (not verified) on Mon, 05/12/2008 - 16:59. Obviously you can't find better things to do with your time, as you spent the past few minutes reading this article...more than likely trying to convince yourself that you know what the schematics were implying, despite the fact you are as clueless as a 12 year old in a bio-chem lab, and then found the time to even post a comment afterwards....Congratulations on your ignorance and immaturity! On the other hand, to the matter truly at hand here... Freakin' brilliant idea to start with, and to materialize the concept into a working protype? Wonderful! Hopefully I can find the time in the next few weeks to attempt to build my own to toy with! Thanks so much for this post, and a special thanks for the detail you went into on creation! Submitted by Anonymous (not verified) on Mon, 10/20/2008 - 14:45. Submitted by Anonymous (not verified) on Wed, 04/02/2008 - 09:06. Submitted by Predrag (not verified) on Mon, 08/22/2011 - 04:37. I'm very interesting for this project, but reason is diferent. On my job place I have 6 new Fujitsu Siemens computers. Monitors, keyboards and mouses for this computers is in control room, and connected with computers over extenders. But, for this computers is necessary to have connected keyboard to boot! I dont know why, Fujitsu support answer me that new BIOS version require this. Your Stealth USB CapsLocker is solution for me, but without capsLocking. How I can do this? Submitted by GrV (not verified) on Wed, 11/09/2011 - 13:02. Hi, have You found solution for Your problem? I'm facing the same thing, temporarily I've removed PCB from keyboard :) It works but it is still too big for me. Your idea is better. Submitted by Tekno Catron (not verified) on Mon, 10/14/2013 - 01:07. Submitted by Anonymous (not verified) on Tue, 04/01/2008 - 21:17. Indeed, this is so awesome I would call it SUPER AWESOME. And for all you morons on irc that like mixed case, this is the tool for you! Just reprogram it for 1-3 seconds! Submitted by Anonymous (not verified) on Fri, 04/04/2008 - 03:05. Agreed. Some people don't appriciate a good, friendly joke. Submitted by Anonymous (not verified) on Tue, 04/08/2008 - 05:33. "Super awesome" would you say that in public? Grow up man. Get out there and live your life. If I may quote Belinda Carlisle "live you life be free, open up your eyes and you will see"
Submitted by Anonymous (not verified) on Fri, 04/11/2008 - 08:29. Submitted by Brain (not verified) on Thu, 04/17/2008 - 16:00.
whoever said this is a comp1337 FAG!!! Submitted by Incredulous (not verified) on Tue, 04/22/2008 - 05:17. Oh the stinging irony of being told to "grow up" for simply saying a particular phrase, then immediately being told to "'live your life to be free'" If the presence of Belinda Carlisle is any indication, this must be some cutting edge, avant-garde flamebait. Submitted by Anonymous (not verified) on Fri, 05/09/2008 - 10:13.
wow, i love reading peoples comments. i havnt laughed so hard in a long time reading the "classic, burning someone with a belinda carlisle song..."
Submitted by Stephen Waits (not verified) on Tue, 04/01/2008 - 21:27. Submitted by Anonymous (not verified) on Tue, 04/01/2008 - 21:29. Submitted by Garrett on Tue, 04/01/2008 - 21:34. I'll make sure to post them tomorrow! Submitted by Anonymous (not verified) on Tue, 04/01/2008 - 22:25. Submitted by Anonymous (not verified) on Wed, 04/02/2008 - 00:39.
hmn, methinks I am about to become annoying on a level that I have never attained before. Submitted by Harry (not verified) on Wed, 04/02/2008 - 00:45. This is such an awesome/hilarious idea. Can u give us the source code? Submitted by stupid hack (not verified) on Wed, 04/02/2008 - 08:19. Submitted by Anonymous (not verified) on Sat, 04/12/2008 - 02:37. Submitted by Anonymous (not verified) on Thu, 04/17/2008 - 18:35.
why is your name not in all caps then? Submitted by Anonymous (not verified) on Wed, 04/02/2008 - 08:47. Submitted by jesus of nazareth (not verified) on Wed, 04/02/2008 - 08:51.
so can you make more and sell them? i would buy about 10 of these little buggers and place them on the computers at work. Submitted by Milea (not verified) on Wed, 04/02/2008 - 09:02. Next, a version for the internal USB header, think this one is hard to spot? Use a CD Rom audio cable and tuck this up above the CD rom drive. Change the code to a PC mouse HID and flip the scroll wheel or jig the X and Y randomly :D, this is so evil, and at the same time awesome. Submitted by Anonymous (not verified) on Wed, 04/02/2008 - 09:12. Or.... why not just steal the motherboard. Then after about 3 days, they will think "Hey! This is just not working right!" Then you can jump out of the closet and yell "April Fools!" and hand them their motherboard back. Submitted by Anonymous (not verified) on Sat, 04/12/2008 - 07:16. Submitted by Conor (not verified) on Wed, 04/02/2008 - 09:09.
the splinter in the toe of the PC. Submitted by Garrett on Wed, 04/02/2008 - 10:19. This was considered, and it totally possible with a double sided PCB and the TSSOP or MLF variants of the microcontroller. Submitted by Anonymous (not verified) on Wed, 04/02/2008 - 09:11. This is precisely the kind of office mischief Thinkgeek adores. You should send this their way, see if they could hook you up with the guys who make the Annoyatron. Submitted by Anonymous (not verified) on Mon, 04/07/2008 - 13:24. It has alreaady been done. Submitted by Anonymous (not verified) on Wed, 04/02/2008 - 11:31. Submitted by Anonymous (not verified) on Wed, 04/02/2008 - 13:24. I HaVe BuILT this BUT I thINK there IS an ISSUe with the INternal CloCK CIrcuit On THE uniT AS it SeeMS TO BE RUnning RANDom BUT WAy Too FasT. Submitted by Anonymous (not verified) on Fri, 10/29/2010 - 10:45. How do we know you aren't just a really slow typist? Submitted by Anonymous (not verified) on Wed, 04/02/2008 - 14:10. Could you make it press insert? Submitted by Garrett on Wed, 04/02/2008 - 14:45. Ah...good catch. Another annoying key I hadn't considered. Yes, it would be very easy. In the current code (posting soon) simply replace 0x39 with 0x49. All the Usage Page 07 keys available are in this document. Submitted by Anonymous (not verified) on Wed, 04/02/2008 - 20:53. "Keyboard Paste," 7D, would be another good one..
how about the home key? Submitted by Anonymous (not verified) on Fri, 04/04/2008 - 14:47.
how about the home key? then in the middle of typing a sentence, BAM its at the beginnning... backspace would also be good.... but capps is awesome... i dont see alt+F4 as a posibility? Submitted by jacques (not verified) on Thu, 04/10/2008 - 13:44. Submitted by Desperate (not verified) on Wed, 04/02/2008 - 15:06. Submitted by Zule (not verified) on Wed, 04/02/2008 - 16:17. This is a nice practical joke to use cautiously. Employers paying salaries for lost productivity caused by a malicious act could consider it sabotage. This could lead to disciplanary actions, dismissal, or even a law suit. Individuals who lose their precious time or lose valuable resources to a "joke" might sue you. It is funny until someone get hurt by the joke. I know many persons with limited troubleshooting and computer skills that this prank could push over the edge emotionally. Please use your gifts to better someone's day. Submitted by Anonymous (not verified) on Thu, 04/03/2008 - 01:22. Yes they could commit suicide which would be the equivalent of pushing evolutions accelerator if you ask me. What a rubbish product, idea for use, and forum. Submitted by Anonymous (not verified) on Mon, 06/02/2008 - 15:19. Submitted by Pablo (not verified) on Wed, 04/02/2008 - 16:29. This would be a fun plan to play on someone somewhat (some, some, some...) techy, it'll drive them more nuts not being able to fix it. Submitted by Stev (not verified) on Wed, 04/02/2008 - 18:22. Garrett, is this the chip you used? Submitted by Garrett on Wed, 04/02/2008 - 18:30. Yes, click here for Digikey link. Submitted by Stev (not verified) on Wed, 04/02/2008 - 22:24. Thanks, although they're sold out until next month. The only site I could find that had them in stock required a $30 minimum order. Is there an MLF version available that you know of which might be carried by Digikey or Mouser? Submitted by Garrett on Wed, 04/02/2008 - 22:46. Oh, that's strange. When I posted this earlier today, I thought there were about 600 in stock. Maybe that was a different part. These are SOIC anyway, and I'd probably go with the TSSOP in a redesign rather than the MLF. If you don't mind paying a few more cents, the ATTiny85 will also work, it just has twice the Flash storage. Submitted by Stev (not verified) on Thu, 04/03/2008 - 13:11. Thanks for the tip on the 85. I just found some 45s through Newark and was able to tack it on another order. But I might try the 85 later to see what I can do with the code. Submitted by David Gabler (not verified) on Thu, 04/03/2008 - 13:14. Will an tiny45V work as well or does it need to be a 0-20mhz? Submitted by Garrett on Thu, 04/03/2008 - 13:28. I don't actually know. Since the 45V is rated for 10MHz and we're using the internal PLL to get a system clock of 16.5MHz, I have to assume it either wouldn't work or might be unreliable. Then again it might be perfectly fine. I always get the 20MHz parts anyway. Submitted by JT (not verified) on Wed, 04/02/2008 - 19:27. Garret - Source code??? Can you post or send. Is it in ASM? Submitted by Garrett on Wed, 04/02/2008 - 19:54. I posted the schematic, pcb, and hex file today...tomorrow I'll post the source code. The AVR-USB package include some assembly files, but the code you interact with will be in C. I find AVR Studio 4 SP2 with the latest WinAVR does really well. Submitted by Anonymous (not verified) on Thu, 04/03/2008 - 06:46. Can you post a complete parts list with Digikey part numbers by chance? Thanks! Submitted by mobs (not verified) on Thu, 04/03/2008 - 06:55.
this is SWEET! its torture for sure! My room mate uses a mac, will this still work? Submitted by Anonymous (not verified) on Thu, 04/03/2008 - 06:59. Submitted by Garrett on Sun, 04/06/2008 - 23:12. Submitted by Anonymous (not verified) on Thu, 04/03/2008 - 08:06. This has great potential for troubleshooting. Can you make one that simulates holding down shift or option (or switchable between both) so I can pop it in, boot the computer and walk away knowing it will boot into safe mode? Submitted by Anonymous (not verified) on Thu, 04/03/2008 - 08:12. There's nothing safe about booting your computer.....minimise the damage by wearing slippers instead of shoes. Submitted by Walter Sobcheck (not verified) on Thu, 04/03/2008 - 08:34. Wow. The amount of people without a sense of humor really disturbs me. I think it's awesome, so long as you're not so cruel to not eventually let your "prey" off the hook. Talk about ingenuity. This is so beautifully simple, and the fact that you're using a firmware based USB core is also amazing. If you can't see the beauty of how simple this little project is, regardless of it's intended use, you're a tech/hack midget. It's also amazing that a bunch of you morons who can't pull your heads out long enough to see this as potentially, mind you, potentially funny are posting their flame-bait as "Anonymous". Losers post flames as "Anonymous". Submitted by Harry (not verified) on Mon, 04/07/2008 - 07:48. We all seem to be singing from the same hymn book Walter, what's your beef? Bad night? Submitted by Marko (not verified) on Tue, 04/08/2008 - 00:06. Submitted by WinstonSmith6076 (not verified) on Mon, 04/07/2008 - 23:29. I am not a techy and only vaguely understand the technology you're describing, however, I do appreciate the deviousness of this PRACTICAL JOKE(sorry, hit the caps lock, I think). I had a friend who was the sys admin in a professional office. He used a program like Back Orifice and would randomly open a user's cd tray or close a program. He even changed the user's sounds to always play the Close Encounters theme. Yes, practical jokes can be taken too far, techy or not, but it is a bunch of fun watching a nervous breakdown. Submitted by Andre (not verified) on Thu, 04/03/2008 - 11:37. Resetting someone's background using keyboard shortcuts or launching particularly colourful web pages comes to mind. Submitted by Anonymous (not verified) on Thu, 04/03/2008 - 16:46. Submitted by JT (not verified) on Thu, 04/03/2008 - 17:22. Thanks for the code Garrett! Submitted by Garrett on Thu, 04/03/2008 - 17:25. Your ATTiny85 should have a fuse you can select for PLL/1k clock source. This will allow the 16.5MHz internal clock generation. Submitted by JT (not verified) on Thu, 04/03/2008 - 17:54. I slapped myself for being so stupid. The Tiny45 and 85 are in the same datasheet, aye. I guess I can measure the exact osc freq by pumping it out the external osc pin temporarily. Is the HEX file in the code for a 16.5MHz clock?? Submitted by JT (not verified) on Thu, 04/03/2008 - 18:14. Or is that HEX file for 16MHz clock? Or to get 16.5 MHz do I use the PLL and start playing with the OSCCAL? Submitted by Garrett on Thu, 04/03/2008 - 18:24. If you can set the PLL fuse and download the hex file, it should be ready to go. The AVR-USB functions have neat way of using the USB bus clock to calibrate the oscillator automatically. Submitted by JT (not verified) on Fri, 04/04/2008 - 00:47. I wired it up to a USB socket & programmer, set the PLL clock source, loaded the HEX file but get "USB Device Not Recognised"
Resistors are 47R and 2k2, not exactly the same as yours but what I had. Submitted by JT (not verified) on Fri, 04/04/2008 - 00:48. Submitted by Garrett on Fri, 04/04/2008 - 02:19. That information would lead me to believe there is an issue with your USB data lines. 16.2MHz is almost 2% tolerance, the AVR-USB automatic calibration is supposed to get within 1%. Since the calibration is based on the USB frame clock, a signal problem would result in an incorrect clock as well. Double-check all of your connections, possibly try resistors higher than 68 ohms if you don't have the exact value on hand. I'm also assuming you have the USB connection correct, but please remember the card edge connector will be reversed from the standard USB pin order. I don't know if you tested the oscillator in a USB port or on the bench. Submitted by Garrett on Fri, 04/04/2008 - 02:25. Also, some computers might not like a USB high level of more than 3.6V. I removed the zener diodes from the original EasyLogger design to save space, because I used 5V levels all the time and it was never a problem. If necessary we might add those back in. Submitted by JT (not verified) on Fri, 04/04/2008 - 12:55. I chucked a couple of 390 ohm in series with the 68 ohm's and "bingo" Found device CapsLocker and HID Keyboard Device is loaded. Just waiting for a CapsLock to happen... OH THERE IT IS!! Dunno what resistors should be, maybe a 2k2/3k3 divider will bring the levels close to 3V? Submitted by jacques (not verified) on Thu, 04/10/2008 - 13:52. It will not work with all PC's, because USB D+ & D- will be working around 5V, and they should be 3V3. You should add 2 zener diodes between datalines and ground. Submitted by Garrett on Thu, 04/10/2008 - 14:14. Submitted by Anonymous (not verified) on Sat, 04/05/2008 - 21:32. How difficult would it be to calibrate the oscillator using a parallel port programmer as opposed to an AVR-USB? Submitted by Garrett on Sat, 04/05/2008 - 23:14. That should not be necessary. It will auto-calibrate to the USB frame clock every time it is plugged into a USB port. Submitted by JT (not verified) on Thu, 04/03/2008 - 19:54. Submitted by Tim K (not verified) on Fri, 04/04/2008 - 08:03. Did you program it through the usb header - i.e. only connecting to reset and pin 6 by clip? I'm wondering if the 2k resistor (or the two 68s for that matter) will affect the programming? Submitted by Garrett on Fri, 04/04/2008 - 09:35. Programming works just fine with the resistors in place. At least with the programmer I'm using right now (ISP from an STK500). Submitted by JT (not verified) on Fri, 04/04/2008 - 13:00. Indeed 2k fouled my cheap STK200/300 compatible programmer - just a 74hc244 ON THE LAPTOP PARALLEL PORT. CapsLocker strikes again... I have a 4k7 betweek pins 1 & 2 of the USB plug which saved disconnecting the resistor during programming. EPROM and Fuses programmed using "BasCom-AVR" software. Don't forget to enable PLL and turn off ClockDiv/8. Submitted by Tim K (not verified) on Mon, 04/07/2008 - 09:16. I'm currently building one of these inside a usb connector although I dont have any AVR parts yet and they seem really hard to get hold of in the UK. I took a scalpel to the outer plastic down one of the seams and cut off the strain relief part so the metal shell slid out. It then opens like a shield can with two little clips and I yanked out all the cables. As it happens, the white plastic piece left perfectly accepts the copper wire from 5A (I think) twin and earth mains cable to form the pins. I've soldered the cap on the ground pin and the 2k between pin 1 and 2, and added two surface mount 68 ohm resistors to the usb pins. They seem to hold perfectly in place. I've then added kynar wire between the cap and vcc. My intention is to solder the avr upside down with its legs facing the pins (90 degrees from how you have it) and tack 4 lengths of kynar on to the pins to connect it up. I can then fill it with hot melt glue and replace the other half of the shield . I may even solder the shield closed. Submitted by Stev (not verified) on Sun, 04/06/2008 - 12:06. Ok. I can't think of a reason off the top of my head why this won't work, so maybe someone can verify for me. What if I were to solder a 2-position surface mount dip switch between the Vcc rail and pins 2 and 3. Couldn't we then Modify the code to read a value from the two ADC lines and switch the keyboard output by flipping switches instead of reprogramming? Submitted by Garrett on Sun, 04/06/2008 - 12:51. That's how the EasyLogger does it. Really, they figured out how to do internal RC with USB because they wanted to make more I/O available...I'm just using it because I want the device to be as small as possible, I don't need all the I/O. But an external switch won't be necessary with the upcoming new firmware and the configuration app. You'll be able to tweak everything and the settings will be written to EEPROM. I would say...one or two weeks away, have too much else going on right now. Submitted by paranoid misanthropic (not verified) on Sun, 04/06/2008 - 19:47. I would sh*t myself with fear if I found that thing sticking out of my USB drive, wipe my HDs, burn the entire contents of my filing cabinet, and probably flee the country. Submitted by Bog Frog (not verified) on Wed, 07/16/2008 - 06:30. Submitted by Anonymous (not verified) on Sun, 04/06/2008 - 20:16. Submitted by Xander (not verified) on Mon, 04/07/2008 - 02:02. Unfortunately, it already has been done, a long time before this was posted. There was a bank robbery attempt using a stealth keylogger/remote controller plugged on an office computer's USB port (here, in France). And the device was kinda the same. Submitted by Andrew (not verified) on Sun, 04/06/2008 - 21:56. I'd like to attempt to make one of these. Mainly for learning purposes. First, I'd like to know what AVR's I should buy. I'd like to try this with DIP style type first, as I've never worked with surface mount devices, and not much electronics in general. I was thinking of either ATtiny45V-10PU or ATtiny45-20PU. I'm not sure whether the 10 mhz or 20 mhz is needed. I don't think it matters, since you set the fuses, but i have no idea. Would either the ATtiny85V-10PU or ATtiny85-20PU work too? Second, I'd like some sort of help with how to set the fuses. I've never done it before. I'm using avrdude if that helps. Any help is appreciated. Thanks. Submitted by Anonymous (not verified) on Mon, 04/07/2008 - 03:14. "ballin with the big dogs"
Submitted by Anonymous (not verified) on Tue, 04/08/2008 - 07:32. "ballin with the big dogs" Pathetic! absolutely pathetic. Submitted by clink (not verified) on Mon, 04/07/2008 - 16:06.
if you load the data onto a normal flash drive and use the auto play, will that work also? Submitted by Anonymous (not verified) on Mon, 04/07/2008 - 20:32. Submitted by Anonymous (not verified) on Wed, 04/23/2008 - 12:02. Submitted by Stev (not verified) on Mon, 04/07/2008 - 17:06. Submitted by Stev (not verified) on Mon, 04/07/2008 - 20:36. I just completed my first Capslocker! Woo! But whenever I plug it into a USB slot it says USB device not recognized, and that pops up about once every 5 seconds. I've checked the Write operation, and it verifies correctly. I can also read the program back from the chip. The only thing I'm not sure about are the security bit settings. This is what I have on there right now. Are these correct? Any any ideas what could be causing it? For reference, I'm using PonyProg with a DT-006 parallel port programmer. Submitted by JT (not verified) on Fri, 04/11/2008 - 03:29. I changed the 68R's for 390R to help with 3.3V compatability (yep parts from the junk box, after Garrets suggestion of increasing the value, voltage divider may be better but bigger!) and then the device is recognised as CapsLocker then HID Device. Works now! I found some 300R SMD resistors for the final build and they too worked. And... I changed the 2k2 for a 4k7 as the 2k2 stopped my parallel port programmer from working. Sorry, not familiar with ponyprog but see my other posts on fuse bits. Submitted by Stev (not verified) on Fri, 04/11/2008 - 20:16. Thanks JT. Those fuses are what I tried to set in PonyProg, but as soon as I write the disable div/8 it goes crazy. The support in PonyProg for ATTiny45/85 is in beta though, so that's probably why. I just didn't know of any other windows-based programmer that supported the DT-006 parallel interface. Once the AVR Dragon comes in I'll use HV programming to reset the chips and try again with AVR Studio. I'm also going to see if Fry's has any 300? SMDs for once my new chips come in. Submitted by JT (not verified) on Sat, 04/12/2008 - 16:38. You can download the demo from www.mcselec.com and it works fuly, only with a compiled code limit of 4kb. I don't know if the programmer side has this limit but the CapsLocker HEX file is below it. Just select your programmer type in the options (I use STK200/300 compatible), click on Manual Program, load the HEX into the programmer buffer, write it, and set 2 fuse bits options, done. Submitted by Anonymous (not verified) on Mon, 04/07/2008 - 20:07. Submitted by Anonymous (not verified) on Sun, 07/20/2008 - 17:09. Submitted by Anonymous (not verified) on Mon, 04/07/2008 - 20:40. I got a couple of cheap 70 cent USB cables from monoprice, and cut off the ends. I used that in place of making my own connector. i know it costs a little more, but it saves some aggravation in the end. Submitted by JT (not verified) on Fri, 04/11/2008 - 03:45. Cutting open the USB connector is fairly easy, nowhere near as small as Garrett's PCB version but works fine. I used the DIP8 AVR package which doesn't quite fit inside the metal shield of the salvaged USB connector but using SMD resistors pinched form other PCB's... makes it fit inside the plastic. I haven't made PCB's for years. It has still been easy to 'hide' in USB ports on the back of PC's and still heaps of laughs. the dust is driving me mad! Submitted by Anonymous (not verified) on Tue, 04/08/2008 - 03:25. Submitted by Anonymous (not verified) on Tue, 04/08/2008 - 05:23. Submitted by Anonymous (not verified) on Tue, 04/08/2008 - 05:50.
how do u actually load the software onto it? put a adapter and connect it to the comp? Submitted by iconic (not verified) on Tue, 04/08/2008 - 15:29.
would someone be willing to make and sell these. I will order a few if they are reasonably priced. Or is there already somewhere to buy it pre-made? Will it work on a MAC!!??? Submitted by Anonymous (not verified) on Tue, 04/08/2008 - 20:12. Submitted by Michael (not verified) on Tue, 04/08/2008 - 21:00. How soon can we get one, or a kit, from Make Magazine's store or Thinkgeek? Submitted by Anonymous (not verified) on Fri, 04/11/2008 - 01:24. They have just been picked up by an international publisher, and will be out soon on a monthly basis. You will get a free binder with part 1, and in 12 months you'll have your idiotic fob.... No you won't because. The mantra has remained unchanged for years - free binder with part one, part two free with part one, part three rarely sees the light of day, end of story. The fools used to call them 'partworks', but come off it. They were 'bindermags', pure and simple. Wake up and smell the coffee as I believe you chaps say over there. Submitted by Andrew (not verified) on Tue, 04/08/2008 - 21:09. It SHOULD work on a mac, since it is displayed as a generic keyboard. But, who knows for sure. P.S. I still need help selecting a DIP chip, and need help with fuses. Please help. Submitted by JT (not verified) on Wed, 04/09/2008 - 18:24. Get the Tiny85 chips as there's more RAM & EPROM to run your other programs... and probably don't cost too much more than the Tiny45, and are otherwise the same. The DIP8 is still fairly small and good to start off with. About the Fuses... not too tricky to but depends on your programmer software. I am familiar with Bascom-AVR Demo can be downloaded from http://www.mcselec.com which has easily selectable fuse options from drop-down lists. For this application you need to enable the PLL clock source, and disable the "Clock Division by 8". These are not the default options programmed into the chips as shipped. Submitted by Zman (not verified) on Wed, 04/09/2008 - 01:24. C1 location on the PCB must be before VCC goes to pin 8, not after it! While electrical connection is the same, there is a difference in terms of noise immunity. Submitted by Garrett on Wed, 04/09/2008 - 01:49. You're technically correct here. However, due to the small size of the IC, the trace length is very short and will really not make that much of a difference...compared to, say, if the capacitor was located inches downstream of the IC power pin and trace characteristics came into play. Mainly I was focused on keeping this a single-sided design and made a few compromises. The double-sided redesign will include more traditional approaches. Submitted by Anonymous (not verified) on Wed, 04/09/2008 - 18:34. Submitted by Andrew (not verified) on Wed, 04/09/2008 - 22:55. The programmer software I've been using is Avrdude. I will ask around a bit, and see if I can get info for it specifically for avrdude. If not, I'll look into the program you suggested. Submitted by overklokan (not verified) on Thu, 04/10/2008 - 12:26. Submitted by Anonymous (not verified) on Thu, 04/10/2008 - 12:27. Nasty, very nasty. I must get one. Submitted by paul (not verified) on Thu, 04/10/2008 - 13:08.
now that is luscious! that will drive anyone freakin insane. nice work. Submitted by jacques (not verified) on Thu, 04/10/2008 - 13:39. How do you get the 3V for usb DATA from the 5V from VUSB ? Submitted by Anonymous (not verified) on Sat, 04/12/2008 - 02:48. Submitted by Anonymous (not verified) on Thu, 04/10/2008 - 17:43. I want to make one of these for my old mac G4 so I can have it boot into target disk mode with out a keyboard on it. I am curious if the mac is going to make and annoying noise to have it just hold Ctl+t after it has been booted. This might make my old G4 really useful again. Submitted by Anonymous (not verified) on Thu, 04/10/2008 - 18:19. For those of you looking for cheap programmers, a parallel port adapter with PonyProg won't work. As soon as I try to uncheck clock/8 the program somehow flips all lock bits and disables the reset pin. I finally gave up and order an AVR Dragon. That should keep me busy with plenty of AVRs. Submitted by Garrett on Thu, 04/10/2008 - 18:51. It worked pretty well. Fuses and everything are done from a command prompt. I set up the programmer so that I could drag a hex file into the shortcut and it would program the device. But now, AVR Studio supports the newer ATTiny chips, and I have an STK500 which I use with a USB-RS232 converter. Submitted by rew (not verified) on Tue, 05/06/2008 - 08:55. For those of you looking for a cheap programmer, a par port programmer will do fine. There are a bunch of designs that include a 74HCxxx buffer chip, but even that is unneccesary. As long as you're very careful the circuit is not connected to anything else, you probably won't blow up your parport. Programming real stuff becomes annoying during development though: Programming is kind of slow, and cannot be done safely with the target circuit "live". So I finally gave up and built my own stk500V2 compatible programmer. Submitted by Anonymous (not verified) on Fri, 04/11/2008 - 21:25. Would it be possible to BUY one of these from you guys? Frankly, I have no idea how to do any of this stuff, but I'd really like one of these. Submitted by ibanez (not verified) on Sat, 04/12/2008 - 10:22. I've used 68R and the 2K as in your schematic, programmed my attiny45 with bascom avr and set the fuse's to Divide/8 off and 10001 pll 1K. I use an attiny 45 20PU (dip) tried your hex file and the one of easylogger. Submitted by Garrett on Sat, 04/12/2008 - 12:46. Please ensure the USB connections are correct. Remember this is a top-side-only layout, and the board is flipped over to put in a USB port, so the USB contacts are mirrored. Submitted by boston (not verified) on Sat, 04/12/2008 - 16:22. Submitted by Stev (not verified) on Mon, 04/14/2008 - 23:17. Alright! I just got my AVR Dragon in. Set some fuses and and it works! Haha, awesome idea and implementation. I can't wait to mess around with the programming. Oh, for what it's worth I have 68? resistors and it works in every computer I've tried so far (~5). I'm going to try and pick up some 300s just in case though. Submitted by Vincent (not verified) on Tue, 04/15/2008 - 09:43. I AGREE, CAN WE PURCHASE ONE OF THESE OFF YOU? Submitted by Anonymous (not verified) on Wed, 05/07/2008 - 00:35. Submitted by SekanS (not verified) on Wed, 04/16/2008 - 08:08. I want mine!! can someone sell one on ebay?? Submitted by Tyler (not verified) on Wed, 04/16/2008 - 18:35. I dont have the resistors. Submitted by Tyler (not verified) on Wed, 04/16/2008 - 18:54. And also, are multiple keypresses possible? Ill make this my login key for school.! Submitted by rup (not verified) on Fri, 04/18/2008 - 03:38. Submitted by uhe (not verified) on Wed, 04/23/2008 - 06:25. Submitted by Stev (not verified) on Sun, 04/20/2008 - 08:50. I have a question on the source code. I've been playing around with it and modified buildReport as follows. If I use 0xE2 as a mod key I can simulate an Alt-Tab, but if I use E1 or E5 to try and simulate the shift key nothing happens. Is there any particular reason it wouldn't work? Submitted by Tyler (not verified) on Sun, 04/20/2008 - 12:06. How do you set the fuse bits in WinAVR? Submitted by Andrew (not verified) on Wed, 04/23/2008 - 21:05. I successfully made a DIP circuit using an ATTINY85-20PU. The hardest part was figuring out the fuses with avrdude. but, the avr calculator helped me out. Submitted by Anonymous (not verified) on Thu, 04/24/2008 - 13:52. How did you set the fuse bits? Submitted by chievous (not verified) on Thu, 04/24/2008 - 07:59. Submitted by Anonymous (not verified) on Sat, 05/03/2008 - 18:31.
i have a little problem, the device is not recognised when plugged before the PC is powered, it goes into a loop of connect and disconect. Submitted by Gaige (not verified) on Sat, 05/03/2008 - 21:28. Submitted by Jerome (not verified) on Fri, 05/09/2008 - 04:56.
nice project indeed. I don't know well the AVR familly, but how do you connect to the USB with a uC which does not include a USB transceiver ? Submitted by Dlinyj (not verified) on Sun, 05/11/2008 - 13:32. Hello. I made the device, as described in your article. Payment is not made. All posted on the circuit board. Uploaded firmware in Microcontroller. Insert the device in a computer's USB port. And the device is not defined. I even tried to change Microcontroller - that does not work. Errors in the scheme no. All collected as you. HEX file downloaded to your page. I do AVR microcontrollers already 3 years. But only write in Assembly, so check your code I can not. I hope for your help. Submitted by Dlinyj (not verified) on Tue, 05/13/2008 - 03:31. All right. The device worked. The problem was incorrectly installed fuse-bits. Submitted by Anonymous (not verified) on Tue, 05/13/2008 - 15:04. HOW DO YOU DO FUSE BITS!??!?! Submitted by Anonymous (not verified) on Sun, 07/20/2008 - 17:16.
what program do you use for programming chips? ^ asking the person ahead of me. Submitted by Rob (not verified) on Mon, 05/12/2008 - 15:52. Submitted by Black_Daemon (not verified) on Thu, 05/15/2008 - 18:11. I am confused as to how you program the chip. Is it possable that you can put up some detailed instructions?? Submitted by Andrew (not verified) on Thu, 05/22/2008 - 08:23. If you are using avrdude, and a USBtiny programmer to program your chip, then this is how you set the fuse bits. Submitted by Hintswen (not verified) on Sat, 05/24/2008 - 23:07. Submitted by Garrett on Sat, 05/24/2008 - 23:49. Submitted by Frank Lewis (not verified) on Thu, 05/29/2008 - 15:17.
i thought of soo many kewl and fun tricks i could do with this device, so i bought all of the parts needed to through it together and i have made the device, i ordered the programmer and got it, now... how do i hook this to the programmer to program it? im pretty new to this(first time) and i really have no clue. if someone could help me out with how to get the programming done i would greatly appreciate it and possibly pay you for your time. feel free to email me at rubymaster3000+had@gmail.com i am a programmer and i know many languages from basic - asm. i just dont know much about compiling and putting the code onto the chip. Submitted by Frank Lewis (not verified) on Thu, 05/29/2008 - 16:10. Submitted by Frank Lewis (not verified) on Fri, 05/30/2008 - 07:47. Submitted by Anonymous (not verified) on Wed, 06/04/2008 - 11:47. Reminds me of an old Amiga program I wrote that hooked into the global input handler and would gradually start eating mouse-right and mouse-down events, to simulate the way a dirty mouse ball would tend to move more in one direction than the other. It was infuriating. Submitted by android_04 (not verified) on Thu, 06/12/2008 - 22:00. If your computer's USB cannot handle the 5V on the data lines, you can use an LED between the power line and the power pin. This works well on my laptop and is easier to implement than 2 diodes. Submitted by koolkat (not verified) on Sun, 07/20/2008 - 17:17. When i print this with eagle...do i select to mirror it? Submitted by Garrett on Sun, 07/20/2008 - 19:02. It's a top side surface mount board, so no. Submitted by SAM (not verified) on Wed, 07/23/2008 - 13:18. It does not work with my laptop (IBM Thinkpad T60). Damn IBM. Works great with my desktop. Unfortunately, all of my nearby co-workers use these laptops. Submitted by Garrett on Wed, 07/23/2008 - 14:40. You might try the solution that uses a diode in series with the ATTiny to drop the output voltage a little. Or place 3.3V zeners in parallel to the data lines. Submitted by SAM (not verified) on Tue, 09/02/2008 - 19:29. I couldn't find any zener diodes in the house, so I put a red LED inline (between the USB power line and the power pin 8). That dropped the power enough to make the laptop happy. Submitted by Flip (not verified) on Tue, 08/05/2008 - 08:49. I successfully built the project! Thanks a lot! Submitted by The Dish Dr. (not verified) on Wed, 10/22/2008 - 16:30. Heh, Reminds me of a prank I pulled one time. I was working as a debug tech, and I had a bench back to back with another tech, I reached under the bench and plugged a USB keyboard and mouse into his PC. I started hitting random keystrokes every now and again when I heard him typing, Then when he'd turn his back I'd hit the windows key or alt+F4. When he was trying to use his mouse I'd move mine around slightly to give him a case of "Drunk Mouse" He got really upset. But it was all in good fun. After a while he thought it was a pretty good prank. Submitted by The Dish Dr. (not verified) on Wed, 10/22/2008 - 16:33. I'd also like to mention I'd love to buy a couple of these if the price was right. Submitted by Anonymous (not verified) on Sat, 10/25/2008 - 15:05. I have just rebuilt this with a PIC10F200... It only sticks out of the USB port by 8mm !! Submitted by Anonymous (not verified) on Mon, 11/29/2010 - 18:37. How did it turn out with a PIC10F200? Submitted by smv (not verified) on Tue, 10/28/2008 - 19:46. Boy did I lEARN A LOT ... haha! that was the device turning on the caps lock. Anyway, I copied everything that I could make out from your images. I made my boards from your image, used the SMD components and even figured out how to make your target board. Now I'm beginning to learn avrdude... the fuses scare me but that link to the AVR Fuse Calculator is excellent. ThANKS AGAIN! -- hehe, yeah, the device again. Submitted by Anonymous (not verified) on Wed, 10/29/2008 - 14:32. Submitted by Garrett on Wed, 10/29/2008 - 14:36. Could be anything from soldering errors, to wrongly-programmed fuses. If you don't know what I mean by fuses, that's probably it. Search this page for fuses and you'll find the correct settings. Submitted by smv (not verified) on Wed, 10/29/2008 - 14:43. Submitted by Anonymous (not verified) on Wed, 10/29/2008 - 15:12. Submitted by Anonymous (not verified) on Tue, 11/04/2008 - 12:06. Submitted by Hyna (not verified) on Sun, 11/16/2008 - 01:53. Hi guys. I have problem with this device. It works fine (ATtinny85-20, zene diodes are placed), but after reseting (powerup too) my computer Windows XP does not recognized CAPSLOCKER. I do same test on three different systems, but result is same. Submitted by Kyle (not verified) on Wed, 12/03/2008 - 18:43. Got it to work after a couple days. I recommend changing your parts list that people are buying parts from because the 68 ohm resistors dont quite cut it on a lot of computers. I'm using some 470s I had laying around and they've worked on every computer I've tried it on so far. Submitted by Garrett on Wed, 12/03/2008 - 19:55. Submitted by Andrew (not verified) on Mon, 12/08/2008 - 05:12. If any of you successfully built this project, then i am going to bet you are going to love this project which is basically the same code and same parts list. But, you put it inside an old NES or SNES controller. I was surprised that the same exact parts (and code practically) were used in a SNES to USB converter. Awesome!! Submitted by manoj (not verified) on Mon, 12/08/2008 - 13:16. Submitted by Anonymous (not verified) on Sat, 01/31/2009 - 13:51.
here's a 1 key keyboard project which is very similar to this project. You just need to change the line of code with the scancode to the f8 key and you're done!! Submitted by Anonymous (not verified) on Sat, 12/20/2008 - 15:27.
how about setting it so it does windows key + m to minimise all open programs, that would anoy the hel out of me. Submitted by philfifi (not verified) on Wed, 04/01/2009 - 04:25. Submitted by John KaBang (not verified) on Sat, 05/30/2009 - 20:04. Did you ever get to the point of selling these? I'm just not a builder with really small stuff. What a riot. Submitted by Damian Kumor (not verified) on Sat, 06/13/2009 - 15:00. Thanks for the info on this. It got me into building circuit so I could build it. Submitted by Anonymous (not verified) on Sun, 07/05/2009 - 14:13. I've built a CapsLocker too, and would like to have it send a sequence of keystrokes instead of just one single key. No matter what I try I end up having the device send at most a combination of two simultaneous keystrokes..
What is needed to have this marvelous little toy send, say, "hello world" instead of just "nothing+capsLock"?